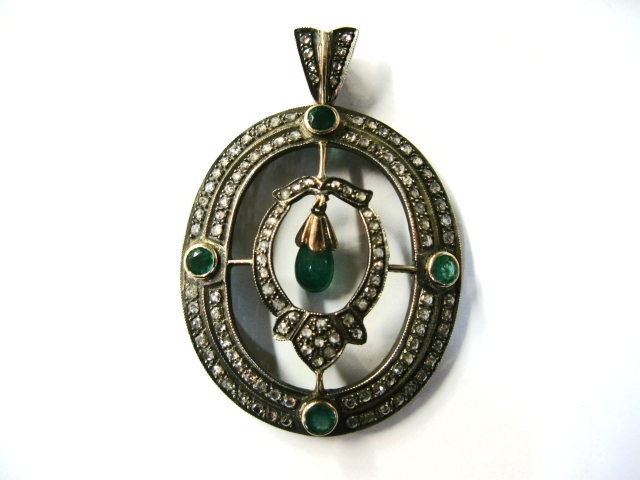 A wonderful custom made 14kt yellow gold with silver top pendant, featuring 1 polished briolette emerald, est. 0.45ct. (clarity: HI & colour: deep green); 4 bezel-set round facetted cut emeralds, est. 0.89ct. (clarity: HI & colour; deep green) and 92 bead-set rose cut diamonds est. 1.17ct. (clarity: SI-I1 & colour: I-J).